Polly has found herself in the middle of a storm. Coming to her aid is a prince called Peace. He stays with her, keeping her calm and safe until the storm passes. Polly learns the importance of finding peace within herself – that it will not only help her through chaotic, scary times but allow her to help others. Peace is the third book in The Invisible Tree series written by pastor Kirrily Lowe. Each themed book aims to encourage personal attributes in young children; this edition focusing, as the title suggests, on finding inner peace when faced with difficult and stormy situations. The story is told in rhyme and is easy to read, making it a great read-aloud book for pre-schoolers or early primary children. The concept of the series has been based on a biblical scripture however the overall tone of the book is not particularly religious. Although there is one reference to God, the book is written in such a way as to make it accessible to all children. The personal attribute of Peace is personified and appears as a young prince, coming in to save Polly from panic. 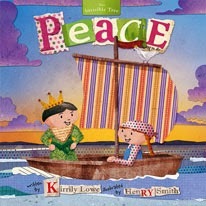 As with the previous books, Henry Smith has created the illustrations for Peace and they are lovely. Throughout the book, he has combined hand-drawn pictures with collages of newspaper, writing or wrapping paper – creating a visual texture on every page. The collage theme also extends to the presentation of the text with seemingly random words being presented as if cut from a newspaper or magazine. Henry Smith is a graphic designer and film maker from the production company Taste Media. His work ranges from handcrafted claymation films to drawings and designs. All of the illustrations in The Invisible Tree series were created from recycled & hand-made papers.